It’s important to note the dahlias are a tuber, not a bulb. Dahlias must be planted in the spring, from April through May for most areas. The Sunset Western Garden Book is a great resource guide with climate zone maps for all the states. The ground temperature needs to be around 60 degrees. Dahlias require full sun, or at least 6 to 8 hours of sun. When you have determined your sunny location, you will need to prepare the soil for planting. If your soil is heavy, its best to add sand, peat moss, or manure to the soil to lighten it up and allow for good water drainage. Using compost will produce weeds, and it is our experience that Preen and other weed prevention products affect the growing process. We plant our dahlias in rows. 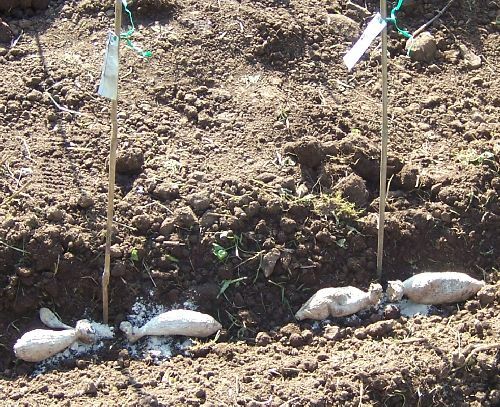 Prior to planting the tuber we sprinkle bone meal, and 5-10-10 fertilizer in the trench before placing the tuber in ground. Dahlia tubers should be planted 4-6” deep, with the tuber on its side with the eye up. with a name tag to identify the flower. We have found that if you are planting multiple tubers in a hole it is best to plant the tuber with the eyes opposite of each other. It is much easier to separate the tubers when it is time to dig after the growing season. In other words, the tubers in the picture below are planted "eye to eye."